Every person should have a system to keep track of information because there’s too much to keep track of in your mind. Interview with David Allen, A Life of Productivity. Evernote is one of the tools in my toolbox that I could not live without. I use it every day to do just that: hold ideas. I started using Evernote in 2008. It was essentially my personal Pinterest board of inspiration before Pinterest existed. I’ve tried other services over the years (ember, DevonThink, VooDoo Pad, and Yojimbo). But, at the end of the day, I can’t get past Evernote’s integration across multiple devices, image support, and easy import. 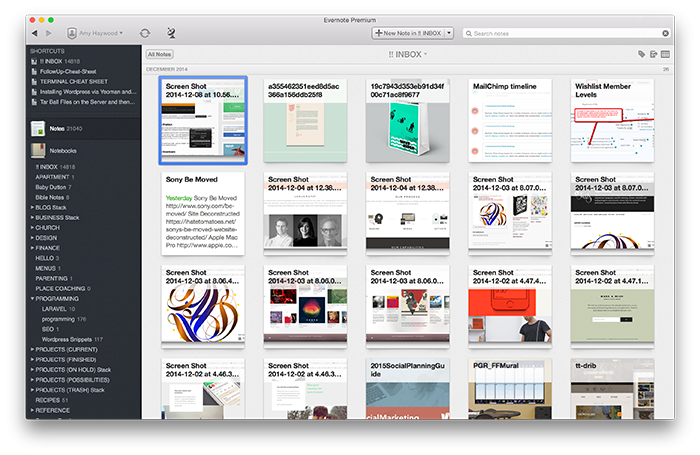 Evernote has a web app and dedicated apps beautifully designed for the Mac, iPad, iPhone, and Droid. This means that regardless of where I’m at or what I’m doing, I have access to my stuff. When you’re talking about a product being an extension of your brain, this is a must. I love being able to sit in a brainstorming meeting about design and be able to quickly locate a piece for visual reference. Email You can send an email to a unique address (provided by Evernote). Practically applied: I have a separate notebook for every client. When a client emails me with content for their project, I’ll forward their email to Evernote, labeled appropriately (#CLIENTNAME) and tagged with @content. This makes it very easy to keep everything together, especially when they send me content in multiple emails from different people. 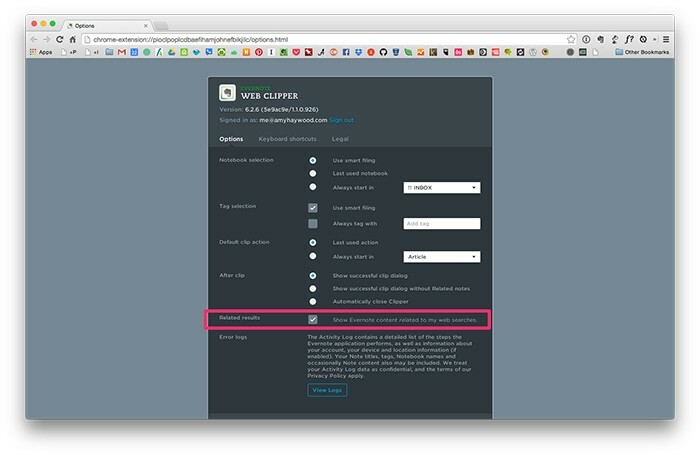 Web Clipper & Clearly Evernote has a browser extension that makes it simple to clip full web pages or parts of a page. Check the settings for this plugin, too. You can set it so that when you Google something, results from your Evernote account are listed to the right. If you end up doing this a lot, check out Evernote Clearly. You can highlight and annotate before clipping. Hazel script I have a folder on my desktop called “SENDTOEVERNOTE” Anything that I drop in that folder, automatically gets sent to Evernote and then deleted from the folder. Where you see “!! INBOX” — that’s the name of my Evernote notebook that it puts everything in. On a good day, I’ll go back through to sort and tag. Programming notebook: I’ll also keep a lot of coding snippets within Evernote. This makes it really easy if I encounter the same problem, but can’t remember the solution or how I set things up. Notebooks: Enter notebook:[notebook name] to search for notes stored in a specific notebook. For example, notebook:apple will display all research related to my aforementioned article about Apple. Tags: Enter tag:[tag] to search for notes tagged with a specific keyword. For example, tag:history will display every note I have created that is tagged History. Entering -tag:[tag], however, will search for all notes nottagged with that specific tag. Dates and Time: If you would like to find every note created in the last day, enter created:day-1 in the search box. Alternatively, type created:day-30to view every note created in the last 30 days, or created:[YYYYMMDD] to view notes created on a day of your choice. For example, created:20140210will show every note created on 10th February 2014. Files and More: Finally, enter resource:image/* to view every note containing an image or resource:audio/* for audio. A little hidden gem that not everyone knows about is stacking your notebooks (kind of like nesting). Simply drag one on top of the other. !! INBOX: This is my default notebook. Everything goes here, first, before it’s sorted. APARTMENT: Notes related to our apartment. For example, we have custom light bulbs for our track lighting system. I have a note about what kind of bulb it is, so when I’m out and about shopping, there it is. BLOG Stack: This contains a separate notebook for drafts and published posts. As the name suggests, drafts contain ideas and posts I’m working on. Once the post is published, it gets moved to the “PUBLISHED” notebook. BUSINESS Stack: This notebook contains business ideas, services, processes, etc. INSPIRATION: This notebook contains all the graphic design images I find online and use for visual research. I use tags for more granular categorization (print, identity, script, color, etc). Reason being: sometimes an image/note will fall into more than one category and you can easily apply more than one tag to an element, but you can only place that note within one notebook. FINANCE: I went thorough a brief stint where I scanned receipts and bills directly into Evernote. Recently, I’ve kept them out of Evernote and in a folder structure on my hard drive. 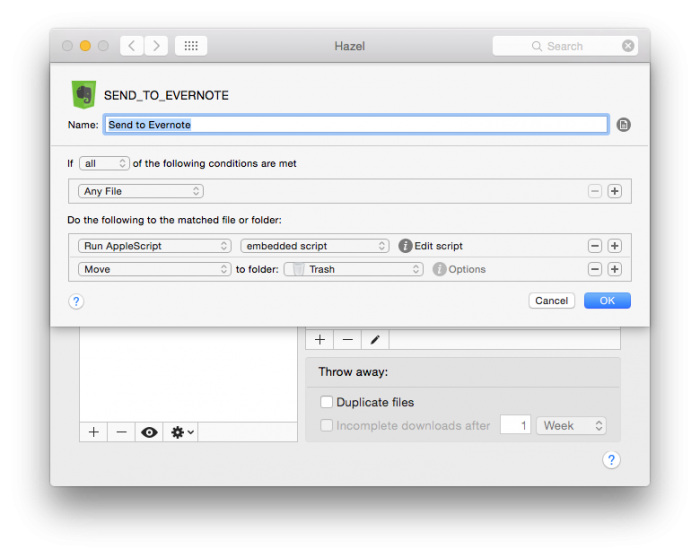 Honestly, I’m not sure which method is better, but I like keeping receipts out of my Evernote results. 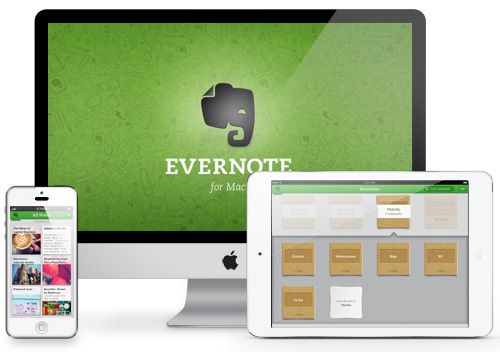 HELLO: Evernote has a few applications that help extend its functionality, Evernote Hello being one of them. This particular app helps keep track of the people you meet, where you meet them, and their contact information. MENUS: This is a great place for keeping menus for local restaurants. PROGRAMMING Stack: I went into some detail about this above. This stack essentially contains code snippets that I use over and over again or snippets I’ve discovered when troubleshooting. PROJECTS (CURRENT) Stack: These are current projects that I’m actively working on. PROJECTS (FINISHED) Stack: These are essentially archives for projects that I’ve finished. PROJECTS (POSSIBILITIES) Stack: Projects that I’ve submitted estimates on, but haven’t been approved yet. RECIPES: As the name suggests, recipes. I just clip recipes I find online. However, Evernote also has an extension for recipes: Evernote Food. I haven’t looked into it, but it may be worth checking out. GIFT IDEAS: When a see something online that would make a good gift, I’ll use the Web Clipper to make a note of it. This helps when birthdays and Christmas roll around. MOLESKINE SCANS: Even though I use Evernote, nothing can beat the old fashioned pen and pencil. I have years worth of moleskines filled. If I have pages that I want to go back and reference frequently, I’ll scan them in and save them to this notebook. Through OCR technology, Evernote has the ability to read your handwriting, so these are easily searchable. TEMPLATES: These are note templates that I can easily right click and “Copy to Notebook…” I have items like Client Needs Analysis Template, Client Profile Template, Meeting Notes Template, Phone Call Template, etc. They all provide a great starting point. REFERENCE: These are items that I want to refer back to later. For example, a trigger list for running a GTD review, User manuals for products I own, cheat sheets, etc. TO READ: These are articles or email newsletters that I want to read later, when I have more time. Similar to Instapaper or Pocket. WISH LIST: This is similar to the gift ideas notebook, except this one is just for me and products I have my eye on. Skitch: I use Skitch to quickly annotate screenshots. Skitch will automatically upload those screenshots to Evernote where I can save them and share them. TRAVEL Stack: I’ll create a notebook for every trip I go on. I’ll forward airline, hotel, and rental car confirmations. This makes it really easy when I’m at the airport trying to find confirmation numbers. Plus, it keeps me from having to search through months worth of emails. I’ll also create a note that contains every address that I might need on a particular trip. Evernote will automatically turn addresses into links so when I pull up that note on my phone, tap on the address, Maps will automatically launch with that address pre-filled. Nice! Needless to say, Evernote is robust. —And just in case you were wondering exactly how robust it is, I have over 21,000 notes!These days, information is not the problem, but keeping track of it is. You need a system in place to help you keep track of everything, otherwise you’ll make yourself go crazy, trying to keep of it all. Are there any tips and tricks you have for using Evernote? How do you have your notes organized?